This used to be a favorite spot for requesting handouts from cars stopped at the light. Albany police have used social media to call attention to a new city law: No more handing money — or anything else — from your car to panhandlers by the side of the street. The city council passed the ordinance on Monday, and with an emergency clause it took effect right away. It’s a tougher version of a law that’s been in effect for two or three years and whose effectiveness apparently had worn off. As the police department explained in a Facebook posting, the new law “prohibits occupants of a vehicle from passing money or property to pedestrians while they are in the roadway.” According to the text of the ordinance, though, the pedestrians need not be “in the roadway” for the offense to take place. Being on the sidewalk counts, too. The law does not apply if a vehicle is legally parked or when there’s an event such as “Fill the Boot,” the annual fundraiser (I think it’s against muscular dystrophy) in which off-duty firefighters accost drivers along busy streets and ask them to throw a dollar or two into the footwear held in their outstretched arms. The law is plainly aimed at stopping what’s become a fixture in Albany and other towns: People standing at street corners holding cardboard signs asking for donations. The text passed by the council, though, justifies it as a safety measure to prevent distracted driving and even road rage caused by delays. 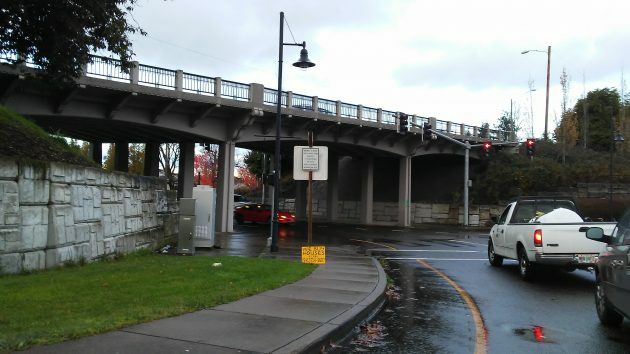 Police Chief Mario Lattanzio told the council during a work session earlier that the previous law, which prohibited holding up traffic in order to give a panhandler something, had resulted in no citations. The new law, too, is unlikely to see enforcement unless an officer actually observes a violation and has the time to follow up. If you’re caught giving somebody something from your car, the law says you can be fined up to $75. The recipient can be fined the same amount. Setting aside the question of whether or not it is wise to offer handouts to people, this is an un-necessary law. If one believes in individual freedom and personal choice, then this law infringes on such concepts. I understand the argument that holding up traffic could be a problem, but I personally have not seen this occur. If it does occur, I believe it is minimal, certainly not enough to require a city law. It seems like the real goal is rather to discourage pan-handling on our city streets, to push the homeless a bit more out of sight. Not recommending this, but it could be the ultimate “sting” operation. Give a buck, get a ticket. What a “fund raiser” for the city of Albany. But as always, any law not equally enforced is worse than no law at all. One can imagine large freeway signage similar to when the governor told people to visit but not stay. This effort by the council will go a long way in backstopping the illusion that Albany does not have a problem with homelessness or other unsavory conditions. Perhaps the council could work with Benton County to re-open Camp Adair as some sort of Internment Center. Out of sight…out of mind. One would think there would already be an existing law for impeding traffic? Did they “remove” the existing ordinance, or leave another apparently useless ordinance clogging up “the books”? Eugene Mayor, Kitty Piercey, along with other Eugene dignitaries, were just feted by Michelle Obama at the White House for the City’s efforts to eliminate homelessness, particularly where it relates to Vets. On the same day, Albany leadership, which claims exhaustion from working overtime on the pesky problem of Albany citizens wanting their weed conveniently, has passed a law that makes both parties to a charity handout out of a car window guilty of a crime punishable by fine. Now everybody’s a victim. The previous anti-auto-charity law provided no income to City coffers as the cops were unable to pass out any citations. Thankfully, the police considered that law for 10-seconds before deciding to not enforce it. The Chief indicated that this new law, designed to shuffle the poor out of sight, will likely result in similar outcomes. In the meantime, even though citizens of Albany overwhelmingly voted to tax their own pot sales by 3% (precisely 3% more revenue than the Council’s new anti-car-charity law will ever bring in) the Council is still gnashing it’s teeth and wringing it’s hands over where cannabis stores might be placed so as not to destroy the Mayberry Illusion now being cemented in place with a Carousel. The homeless just need to get baskets on the end of long poles then they can collect money from outside the roadway. Seriously though I don’t see what this is solving. Thou shalt not extend mercy thru the window of thine chariot.